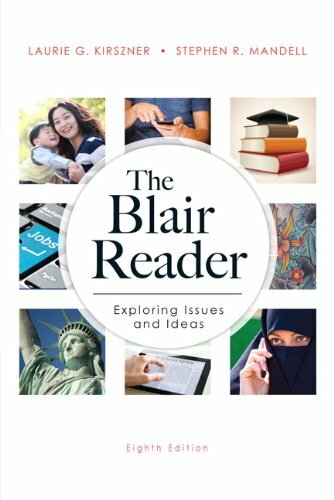 The Blair Readerencourages public discussion in the wider world by reading actively as well as critically and responding to the ideas of others. After more than twenty-five years of teaching composition, the authors have come to see reading and writing as interrelated activities: To write effectively, one must also read actively and critically. The authors have found and strongly believe that a reader is enriched and engaged when he/she view the reading and writing they do as a way of participating. From the beginning, the goal inThe Blair Readerhas always been to encourage these discussions in the wider world by responding to the ideas of others. E. B. White, "Once More to the Lake"
Maxine Hong Kingston, "No Name Woman"
Alice Walker, "Beauty: When the Other Dancer Is the Self"
[&ast;]David Jacobsen, "Reflections: Growing-Up Grown"
[&ast;]Focus: Are "Chinese Mothers" Superior? [&ast;]Amy Chua, "Why Chinese Mothers Are Superior"
[&ast;]David Brooks, "Amy Chua Is a Wimp"
[&ast;]Sophia Chua-Rubenfeld, "Why I Love My Strict Chinese Mom"
John Holt, "School Is Bad for Children"
Bich Minh Nguyen, "The Good Immigrant Student"
Charles Murray, "Should the Obama Generation Drop Out?" [&ast;]Scott Adams, "How to Get a Real Education"
[&ast;]Johann N. Neem, "Online Higher Education's Individualist Fallacy"
Christina Hoff Sommers, "For More Balance on Campuses"
Fiction: Edward P. Jones, "The First Day"
[&ast;] Focus: Is a College Education Worth the Money? Daniel S. Cheever, Jr., "Is College Worth the Money?" [&ast;]Jacques Steinberg, "Plan B: Skip College"
Graduates" [&ast;]Stephen G. Emerson, "Is College Worth the Money?" [&ast;]Oscar Hijuelos, "Lost in Time and Words, a Child Begins Anew"
Alleen Pace Nilsen, "Sexism in English: Embodiment and Language"
Jonathan Kozol, "The Human Cost of an Illiterate Society"
[&ast;]Christopher M. Fairman, "Saying It Is Hurtful; Banning It Is Worse"
Focus: Is Texting Destroying the English Language? John Humphrys, "I h8 txt msgs: How Texting Is Wrecking Our Language"
David Crystal, "2b or not 2b?" Louis Menand, "Thumbspeak: Is Texting Here to Stay?" [&ast;]Peter Funt, "So Much Media, So Little News"
Salman Rushdie, "Reality TV: A Dearth of Talent and the Death of Morality"
[&ast;]Jonathan V. Last, "TV for Tots: Not What You Remember"
Mary Eberstadt, "Eminem Is Right"
[&ast;]Max Brooks, "The Movies That Rose from the Grave"
[&ast;]Eli Pariser, "When the Internet Thinks It Knows You"
[&ast;]Nicholas Carr, "Does the Internet Make You Dumber?" [&ast;]Steven Pinker, "Mind over Mass Media"
[&ast;]Jane McGonigal, "Reality Is Broken"
Focus: Does Social Networking Connect Us or Keep Us Apart? Alice Mathias, "The Fakebook Generation"
[&ast;]David Carr, "Why Twitter Will Endure"
[&ast;]Sherry Turkle, "Connectivity and Its Discontents"
Poetry: Marge Piercy, "Barbie Doll"
Poetry: Sharon Olds, "Rite of Passage"
E. J. Graff, "The M/F Boxes"
[&ast;]Jennifer Finney Boylan, "Is My Marriage Gay?" [&ast;]Kathleen Deveny, "Who You Callin' a Lady?" [&ast;]Karen S. Sibert, "Don't Quit This Day Job"
Judy Brady, "Why I Want a Wife"
Focus: Who Has It Harder, Girls or Boys? Stephen Hinshaw, "What Is the Triple Bind?" Christina Hoff Sommers, "The War Against Boys"
Women: It's Faulty Research That Sets Them Apart"
[&ast;] Poetry: Rhina Espaillat, "Bilingual/Bilingue"
[&ast;]Elizabeth Wong, "The Struggle to Be an All-American Girl"
[&ast;]Clara E. Rodrguez, "What It Means to Be Latino"
Jeffery Sheler and Michael Betzold, "Muslim in America"
[&ast;]Sherman Alexie, "I Hated Tonto (Still Do)"
[&ast;]Brett Krutzsch, "The Gayest One"
[&ast;]Melanie Scheller, "On the Meaning of Plumbing and Poverty"
[&ast;]Focus: Are We Moving toward a Post-Racial Society? [&ast;]Brent Staples, "Why Race Isn't as 'Black' and 'White' as We Think"
[&ast;]John H. McWhorter, "Why I'm Black, Not African American"
[&ast;]Elizabeth Chang, "Why Obama Should Not Have Checked 'Black' on His Census Form"
Gish Jen, "Coming into the Country"
[&ast;] Poetry: Pat Mora, "La Migra"
[&ast;]Focus: Should Undocumented Immigrants Have a Path to Citizenship? [&ast;]Jose Antonio Vargas, "Outlaw: My Life in America as an Undocumented Immigrant"
[&ast;]Rory O'Connor, "Jose Antonio Vargas Is an American Hero"
[&ast;]Esther Cepeda, "Jose Antonio Vargas's Lies Deserve No Sympathy"
Andrew Curry, "Why We Work"
Gary Soto, "One Last Time"
Arlie Hochschild, "The Second Shift"
[&ast;]David Brooks, "It's Not About You"
[&ast;]Lynn Peril, "Do Secretaries Have a Future?" Robert B. Reich, "Don't Blame Wal-Mart"
Henry Louis Gates, Jr., "Delusions of Grandeur"
[&ast;]Warren Farrell, "Exploiting the Gender Gap"
Fiction: John Updike, "A & P"
[&ast;] Focus: Are Internships Work Experience or Exploitation? [&ast;]Ross Perlin, "Unpaid Interns, Complicit Colleges"
[&ast;]Elizabeth Cronin, "Interning or Indentured?" [&ast;]"Unpaid Interns: Rewarded or Exploited?" Poetry: Robert Frost, "The Road Not Taken"
[&ast;]David A. Hoekema, "The Unacknowledged Ethicists on Campuses"
[&ast;] Focus: What Has Happened to Academic Integrity? [&ast;]University of California Davis, "Why Academic Integrity Matters"
[&ast;]Richard A. Posner, "The Truth about Plagiarism"
[&ast;]David Callahan, "A Better Way to Prevent Cheating: Appeal to Fairness"
[&ast;] Poetry: Matthew Arnold, "Dover Beach"
Rachel Carson,"The Obligation to Endure"
[&ast;]Joel Kotkin, "The Changing Demographics of America"
William C. Symonds, Brian Grow, and John Cady, "Earthly Empires"
[&ast;]Neal Gabler, "The Elusive Big Idea"
[&ast;]Michael S. Malone, "The Next American Frontier"